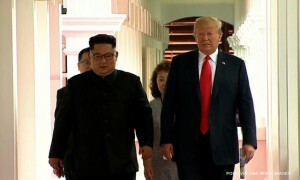 White House press secretary Sarah Sanders said Monday that President Donald Trump is open to another meeting with North Korean dictator Kim Jong Un despite national security adviser John Bolton’s assertion that the US is still waiting for Pyongyang to take steps toward denuclearisation. Trump has received another letter from Kim, which Sanders described Monday as “very warm” and “very positive,” noting that the White House will not release the letter unless Kim agrees. Sanders’ comments came hours after Bolton said Trump has “tried to hold the door open” for Kim to denuclearise, but the US is still waiting on Pyongyang to take those steps. South Korean officials also said last week that Kim has “unwavering trust for President Trump” and wants to achieve the denuclearisation of the Korean Peninsula before the US leader finishes his term. “This trust, despite some difficulties surfaced during the negotiation process between the US and the North, will continue,” said South Korean special envoy Chung Eun-yong, who met with Kim in Pyongyang on Wednesday. Over the weekend, North Korea celebrated its national day with a series of massive spectacles glorifying 70 years of rule by the Kim dynasty Sunday, but held back on any mention of its nuclear weapons programme a possible signal of support for Pyongyang’s ongoing negotiations with the United States.